Traipsing through Moda on the Asian side of Istanbul I was searching for a Mexican. Back in Texas I’d heard that an hombre had moved over to these parts, settled down with a Turkish gal and went ahead and opened his own bar. Sounds like my kind of place. A Mexican cantina in Turkiye. I finally found the bar I was looking for but it was closed so I was at loose ends. I had a couple hours to kill so I went on a nice long hike when I spotted this little sweet shop. The Turks running the joint were fascinated that I’d found them. They didn’t speak a lick of English but thankfully a nice Turkish gal was there who was bi-lingual and she interrogated me for them. They wanted to know all about Texas, Kentucky and a cat named Obama who they were real excited to have in office as they loved a Muslim in power in USA. I went along with it and mentioned that back in Illinois everybody in his district carries a prayer rug and faces Mecca a few times a day. They all nodded. I’ve written a bit about Baklava in the past as it’s been one of my favorite sweet treats since I was just a little shaver. 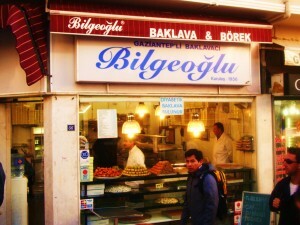 Well, Gaziantep’Li Baklavaci really shines in this realm. This is lightly sweetened baklava with an impossibly light phyllo pastry. The little shop has a few other offerings so I load up for sweet treats for my room back at the Inn. The friendly Turks running the place hate to see me go but I’ve got a ship to catch. Got to get back to Europe I explain. They nod. It’s nice to get some down home hospitality when you’re a few thousand miles from the house. The Turks really know how to roll out the welcome mat. I’ve traveled all over and nobody, outside of Alabama, can match them for graciousness and outright friendliness.